Sunday, December 15th at 2pm at San Francisco Conservatory of Music. Sunday, May 19th at 11am & 12:30pm at San Francisco Conservatory of Music. Saturday, April 13th at 4:00-5:00pm on-site at Amabile School of Music. Saturday, February 2nd at 4:00-5:00pm on-site at Amabile School of Music. Sunday, December 2nd, 2018 at 10:00am & 11:30am at San Francisco Conservatory of Music. Saturday, October 20th, 2018 at 4:00pm on-site at Amabile School of Music. Saturday, October 6th, 2018 between 9am to 4pm on-site at Amabile; 2-6pm at the West Portal Playground. Saturday, August 11th, 2018 at 4:00pm on-site at Amabile School of Music. Saturday, May 6th. For enrolled students recommended by teachers only. Sunday, October 23rd, 2016 at 1pm & 3pm on-site at Amabile School of Music. Sunday, July 31st, 2016 at 2pm at Kokoro Assisted Living at Japan Town (for enrolled students only). Sunday, March 20th, 2016 at 3-4pm at San Francisco VA Hospital (for enrolled students only). Saturday, December 12th, 2015 at 4pm at Amabile School of Music (by invitations only). Sunday, November 29th, 2015 at 2pm at San Francisco Conservatory of Music; Recital Hall and Osher Salon (open to public). Tuesday, July 21st, 2015 at 6:00-7:00pm at San Francisco VA Hospital (for enrolled students only). Sunday, June 14th, 2015 at 1:30pm at San Francisco Conservatory of Music; Recital Hall and Osher Salon (open to public). Sunday, March 1st, 2015 (open to public) at Steinway Piano Gallery, San Francisco. Poster shown above. December 13th, 2014 (by invitation) at Amabile School of Music. November 30th, 2014 at San Francisco Conservatory of Music, Recital Hall (open to public). Photos shown below. 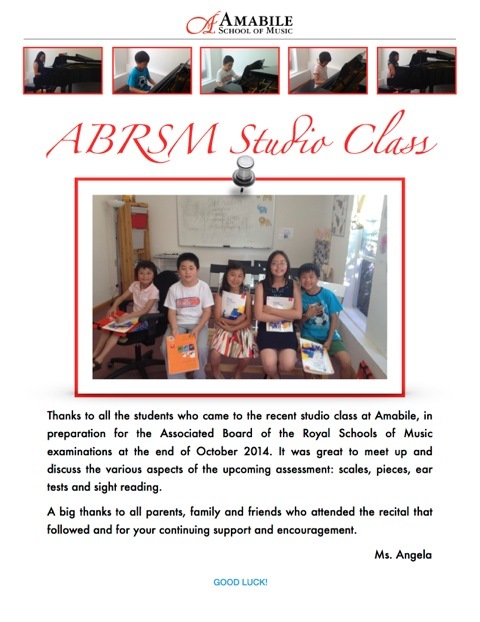 October, 2014 at Amabile School of Music (private event). Poster shown here. September 6th, 2014 at Amabile School of Music from 11am to 1pm (for current students only). June 1st, 2014 at San Francisco Conservatory of Music. Recital Hall & Osher Salon (open to public). Recital Hall at San Francisco Conservatory of Music from 2 to 4pm on January 5th, 2014 (open to public). December 18th, 2013 on-site at Amabile (private event).